In December 2018 Manager John Still left Barnet to concentrate on his retirement although subsequently he took on a Director of Football role at Maidstone United. This left his Number 2 Darren Currie as Caretaker at the Hive until he was given the permanent position in January 2019. He guided the club to safety in the National Premier after a few shaky weeks and hopefully the Chairman Tony Kleanthous will show faith and invest in Darren for 2019-20? Currie was certainly one of the classiest players ever to wear a Bees shirt. Darren Paul Currie was born in Hampstead in November 1974 and virtually everyone in the football world knows that he is the nephew of Sheffield United, Leeds United and England International Tony Currie. At the relatively late age of 18 Darren started as a trainee at West Ham United in 1993 although he never made the first team but was squad listed alongside two future Barnet managers in the aforementioned Martin Allen and Mark Robson. After a loan spell at Leyton Orient he joined Shrewsbury Town for a £70,000 fee. Released in March 1998 Darren played a handful of games at Plymouth Argyle before Bees Manager John Still, to his credit, signed Currie on a free transfer ready for the start of the 1998-99 season. Currie made his Barnet debut in the following line-up at Darlington on 8th August 1998 in Division Three..
Lee Harrison, Sam Stockley, Warren Goodhind, John Ford, Robert Sawyers, Phil Simpson, Udo Onwere, Paul Wilson, Darren Currie, Ken Charlery and Scott McGleish. Subs Marlon King, Billy Manuel and Michael Harle. The game finished 0-2 with Darren scoring the opening goal on 70 minutes brilliantly flat-footing defenders to give the travelling Barnet fans a glimpse of what was to be a regular viewing over the next three seasons. Darren cleverly set up Scott McGleish for the second to round off the day. 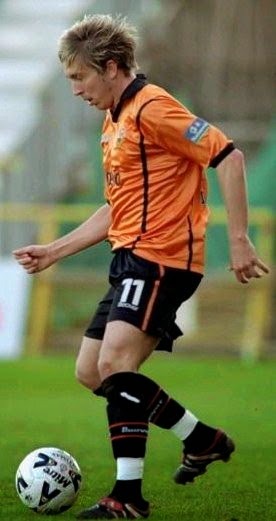 He made 42 appearances that season scoring six times and although Barnet finished in a disappointing 16th place, week after week Currie grabbed the headlines and soon became an icon on the Underhill terraces. His signature chant "We got Currie, Currie, we got Currie, Darren Currie, Currie......” to the tune of Lip Up Fatty by Bad Manners was sung with gusto every week. The following season Currie helped a 6th placed Barnet to the 3rd Division play-off semi final where we lost 5-1 on aggregate to Peterborough. Mainly linking up with John Doolan in a the midfield he made 45 appearances scoring five goals. The 2000/1 season, in which Darren made 49 appearances scoring 10 goals, was of course our devastating relegation to the Conference season. However looking back at the team we were able to field it still amazes me how we capitulated. There were so many highs early on especially the 4-3 victory over Lincoln City, when the Bees were 3-0 down and the absolute demolition of Blackpool at Underhill 7-0. That day saw a debut opening goal from Tony Cottee and Darren, having arguably his best ever game in amber and black, score a hatrick . The final game of that campaign was of course against Torquay United in a loser is relegated scenario. “We lost Lee Harrison though injury in the first minute and he was stretchered off and although Danny Naisbitt was a very good substitute the incident upset the focus of the team somehow” said Darren. Darren unfortunately missed a poorly taken penalty in the first half which would have got Barnet back to 1-2 and he himself has commented to me that he just couldn't get going that day and it was perhaps the most painful day of his whole career. He certainly was off colour and the game marked a frankly disappointing swan song to his Barnet career. Lee Harrison, Sam Stockley, Lee Flynn, Greg Heald, Mark Arber, Darren Currie, John Doolan, Danny Brown, Warren Goodhind, Wayne Purser and Tony Richards. Currie was never blessed with lightning pace for an out and out wide player but could completely deceive a defender with a body swerve or a feint inside to create space. He sold so many dummies he should have had shares in Mothercare! His goal in the 2-1 win at Swansea City's Vetch Field in November 1999 (available on You Tube by the way) perfectly demonstrates this genius and his class – a truly wonderful goal. To the dismay of the Underhill faithful, in July 2001 Currie was transferred to Wycombe Wanderers in a £200,000 deal. With the greatest of respect he was a far better player than most in the Conference and his eventual elevation to Championship level was fully deserved. He spent three seasons at Adams Park before a move to Brighton & Hove Albion in August 2004. After 20 odd appearances at Christmas 2004 the Seagulls received £250,00 from Ipswich Town. Currie became an instant hit with their supporters, scoring some quite brilliant and outrageous goals. Darren went on to represent Coventry City, Derby County, Luton Town and Chesterfield before reuniting with John Still at Dagenham & Redbridge in 2009. I saw him shortly after this playing for Hendon at Potters Bar Town in a central midfield role. He still oozed class at nearly 40 and the memories came flooding back as he strutted around while taking complete control of the game. One or two passes seemingly went astray but you soon realise that the ball was actually perfect, it was the receiving player who was not even close to being on Darren's wavelength! He guested for Barnet in Lee Harrison's Testimonial game in 2011, “I simply had to have Darren playing” said Lee. 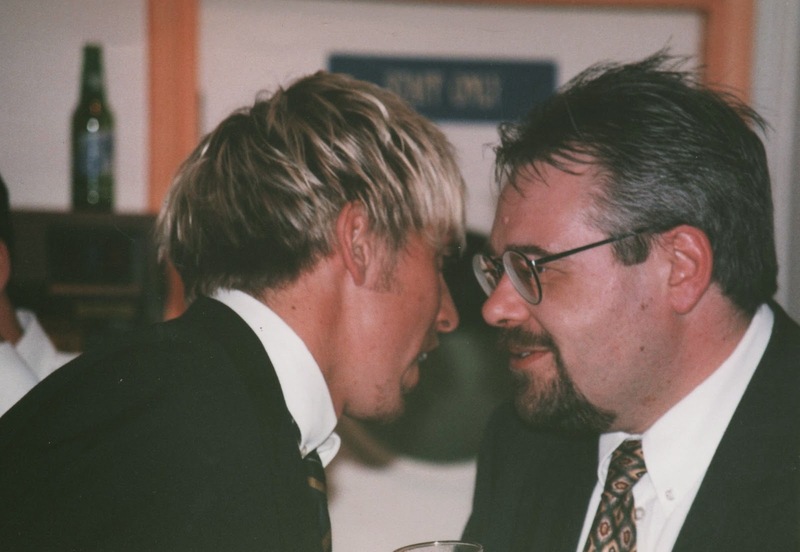 Darren was at Underhill in an era when players were so much more approachable and many would mingle with supporters in the Durham Suite bar after games. Darren and his close friend Sam Stockley were the friendliest of all. In the modern idiom I fear that type of interaction between fans and player has disappeared, which is a shame. He and Sam left the bar at the very last minute with the cleaners and his admirers, including me, at a club function once, or was it twice? 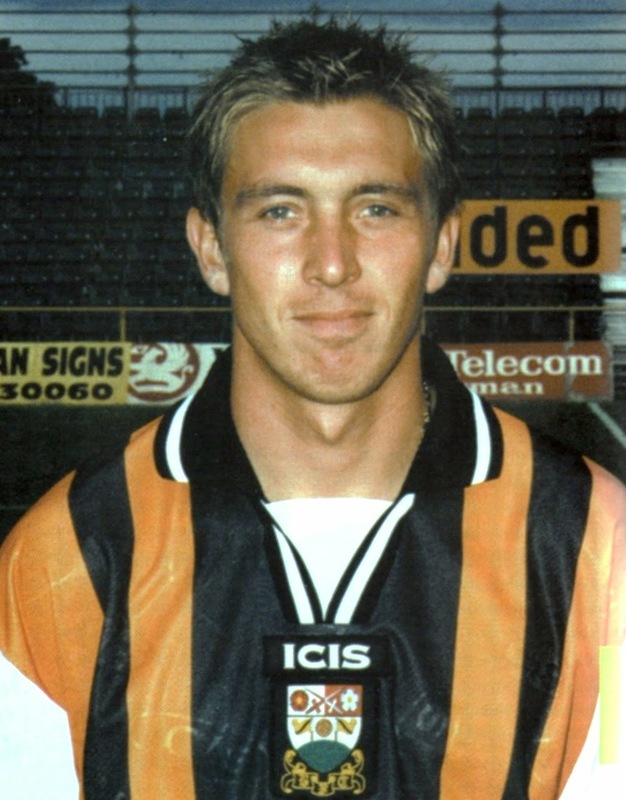 For all his qualities Currie was never voted Player of the Year while at Underhill – a fallacy some say? Unfortunately for Dazza he was competing against Harrison at the height of his powers and prowess at the time, otherwise it would have been a forgone conclusion as he was another player the likes of Freedman, Clarke, Powell or Lowe that could turn a game in a flash and send an instant buzz of excitement around the ground whenever he received the ball – a very rare attribute. If it is possible for him to pass on this attribute or his footballing brain, in even a small way to one or more of our squad in 2018/19, then he will be worth every penny of his wages. Welcome back "Ruby".